This was one of the dozen or so comics that I purchased at WonderCon a couple of weekends back. Why? I could not tell you. I'm a sucker for $1 books picked up from joyless comics-table supervising harridans, and specifically a fan of Dell's mighty Four Color, one of the greatest of all comics series. Rhubarb was a reasonably successful and now almost completely forgotten motion picture based on the humor book by H. Allen Smith. All I know about Smith is that he authored the hit Low Man On The Totem Pole -- my father had a copy -- and that he was touted as part of a generation of newspaper writers that crossed over due to the public's appetite for crisp prose sprinkled with, I kid you not, what passed for pop culture references of the day. 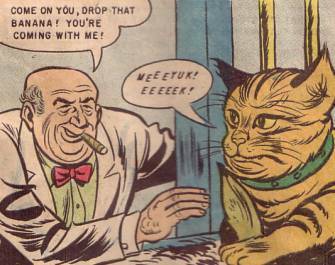 The movie version of Rhubarb generated enough appeal that there were three different issues of Four Color given over to the furry fellow; this is the third. This comic is quite terrible. There is some modest attention to craft in evidence: many of the figure drawings are amusing, you can generally tell what's going on and the dialogue is serviceable. It is not enough to overcome the parts that feel hacked out. Few characters, including Rhubarb, look the same panel to panel. There is almost no background detail, and certainly no rhythm to any of the pages. The weak attempts at humor would fail to register a smile on the most cat-delighted person's visage. As a character, Rhubarb acts out as kind of a less smarmy Garfield, a heavy-set mediocrity with thuggish leanings. 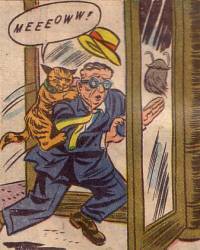 The plots are standard radio/television-show hokum, building on the movie's harried-man set-up with a lot more attention to Rhubarb himself. Lettering-wise it's the spiritual grandfather to the recent and very ugly Twilight volume: soulless, typeset press placed at odd locations in strewn-about, cramped white space. It's hard to imagine anyone having a lingering fondness for this comic, and this issue in particular could well test the adage that every comic book is somebody's favorite. However, that doesn't mean it doesn't have it charms, as peculiar and fragile as they might be. One thing I like about Rhubarb is that the resolute pacing means you get all the Rhubarb you could ever stand. The cascade of pages may feel like punishment, but it's a punishment doled out by a very fair person who is going to not let you out of the corner until the second that minute hand hits twelve. I'm not sure anyone would do a comic this bad for this many pages now. The other is that I've always been a bit fond of stories where pets stand in for humans. 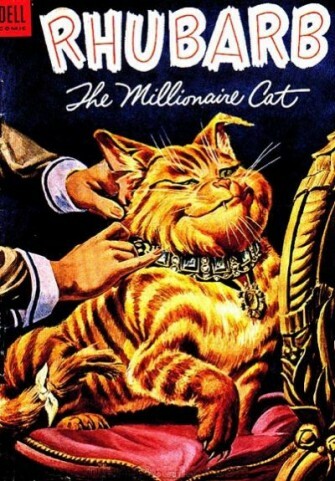 There's a significant amount of contempt for one's fellow humans in the act of lavishing one's pets with wealth beyond what they can eat, sleep on and be scratched by: Rhubarb's approximately $350 million in modern money would qualify. There's even more of a withering view of mankind in any story were pets prove to be high-functioning operators in human jobs, when they come through on the notion that they'll do it just as good as any rational human being. The Yippies didn't run Pigasus for president as a way to flatter the two men striving for the job from the major parties. Again, Rhubarb owns a major league ball club and proves as adroit at doing so as any Steinbrenner. If only in concept alone, Rhubarb manages at least that much of a chuckle. It was totally worth a buck.